Flexible hire services with low rates. Free with every bike is a helmet, lock, tool kit and water bottle, plus maps and tips. You can also hire panniers or a bicycle trailer to make up a complete touring bike. You can browse through our library, store gear, plan your New Zealand cycling holiday or share your stories with us. 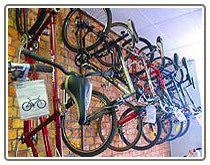 We hire bikes, panniers, shoes and equipment including helmets, locks, pumps, toolkits, etc. We offer both cycle hire, and bike purchase for brand-new bikes with a 6-month guaranteed buy-back. Please call or contact to arrange a rental, or for further information.